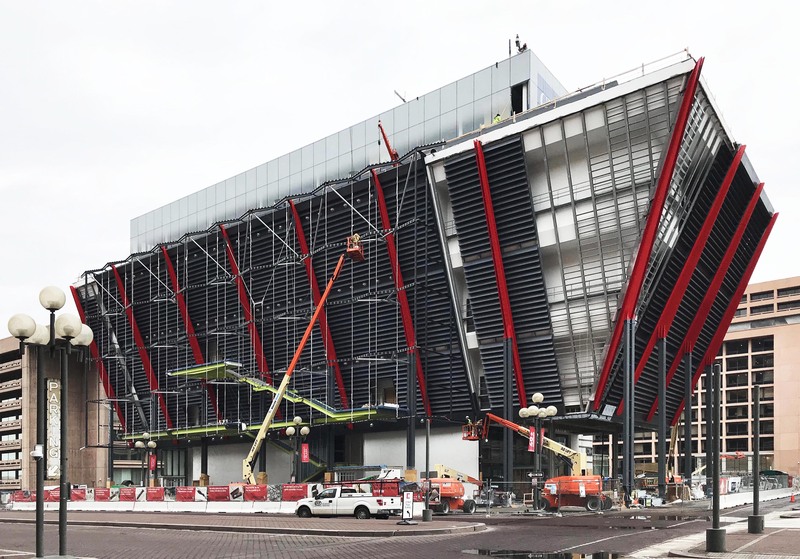 Powerful sloped columns, folded metal panel skin, and a pleated glass veil comprise the International Spy Museum. Spying and espionage are typically covert, not celebrated functions. But the Washington, D.C.,-based International Spy Museum, a private, non-profit museum dedicated to the tradecraft, history and contemporary role of espionage, does just that with the largest collection of international espionage artifacts anywhere. New York City-based Eckersley O'Callaghan (EOC) is the facade engineer that worked with RSHP on design phase engineering of the veil. Yalin Uluaydin, senior associate at EOC's New York office, claims there aren't any structures or facades in Washington, D.C., as unique as this museum. "To reduce lead times and cost, we avoided the use of a triple-pane laminate and limited options to glass thicknesses like 10-mm or 12-mm, which are more readily avilable," he says.